As you may or may not know, Chalet Braye has been undergoing a major refurbishment this summer. This old favourite in Meribel Village can now sleep up to 10 – with a whole new layout, and also benefits from all ensuite bathrooms and WCs. Chalet Braye remains the perfect spot for those who want a hassle-free holiday. 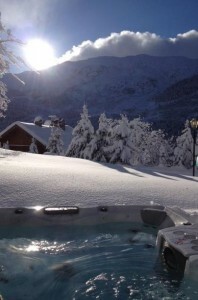 Located in Meribel Village, with a hot tub and only 70m from the high speed Golf chairlift and Lapin piste, Chalet Braye combines convenience for skiing with a fantastic view across the Roc de Fer. Added to this, guests were able to ski back to the chalet terrace all of last winter. Chalet Braye is also just a 2 minute walk from little hub of the Village with its great bar, famous bakery and convenient supermarket. Is this doesn’t tempt you enough, until the 31st December we are offering 2 for 1 Three Valley Lift Passes for your group when you book Chalet Braye for any December or January week this winter. Save nearly 300 Euros between 2 people and 1200 Euros for the whole group! T&CS – Valid only for Chalet Braye bookings for week commencing 9th December and 8th January. Offer expires on the 31st December. Offer applies to a maximum of 6 people / 3 ski passes only.